What do you do when your mower break down? For most of us it's probably let the grass grow a bit while we save up for a new one. However this option is not available for Worcester Park Cricket club. The ground at Green Lane needs regular maintenance so the cricket can continue. Cricket clubs apparently need two special mowers. One extremely expensive one to do the actual pitches and another just regularly expensive one to do the wide stripes in the rest of the grass. It is this second one that gave up the ghost recently and has to be replaced. Luckily Worcester Park Cricket Club managed to find a second hand one which Wimbledon Golf Club were selling (so it's the same one used for gold fairways as well) for £2000. The club doesn't have that sort of dosh lying around so fortunately a member stumped up the cash as a short term loan so they could keep the cricket going. However it rather leaves the club in a hole to the tune of £2000 which needs to be paid back forthwith. So with such an urgent financial need the club has decided to give away their one day annual entitlement to a hospitality box at the Oval as a prize in order to try to raise the money for the mower. The club are now selling raffle tickets for this prize. 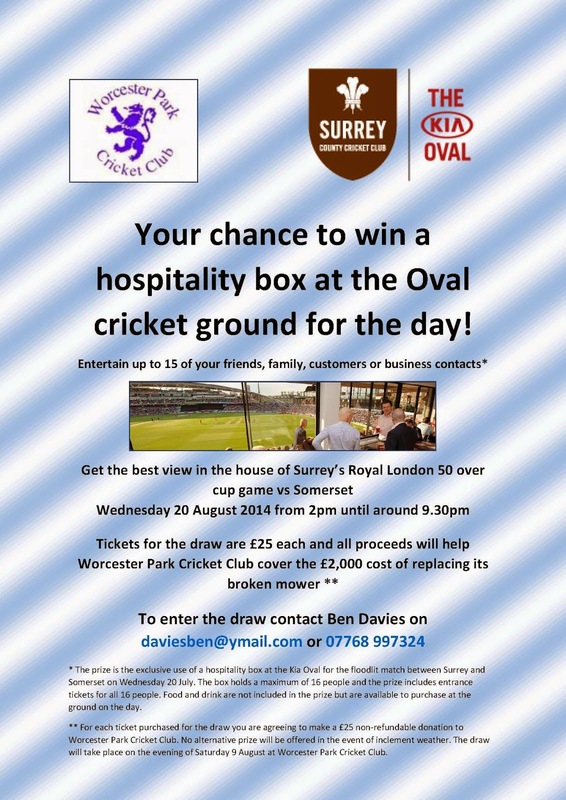 The lucky winner will be able to spend a major chunk of Wednesday 20th August entertaining family, friends, clients, a collection of cacti, whatever you want in a hospitality box at the Oval with a stunning view of Surrey’s Royal London 50 over cup game vs Somerset. If that isn't a fantastic prize for any true cricket lover I don't know what is... Tickets are £25 each with all proceeds going to cover the £2000 cost of the replacement mower. To get your ticket for this amazing raffle, contact Ben Davies on daviesben@ymail.com or you can telephone him on 07768 997 324. For more information have a look at their facebook page here. Please help your local cricket club and maybe win a great prize too!